Although sweet potatoes may be part of the Thanksgiving tradition, be sure to add these wonderful naturally sweet vegetables to your meals throughout the year; they are some of the most nutritious vegetables around. The glycemic index of sweet potato is 54 which falls under low GI category, but due to high carbohydrate content, the glycemic load of ½ cup of sweet potato cubes is 11.3 which is categorized into medium GL range. Is Sweet potato safe for Diabetics? It is important to closely monitor the carbohydrate intake in an entire day and minimize its impact on blood glucose and insulin release. 45 to 60 grams is the amount of carbohydrate you need, based on your blood sugar levels. So when you choose to have ½ cup of sweet potato cubes in your meal which provides you around 21.1 g of CHO, you ought to limit your other carbohydrate rich foods. That’s how the levels will be maintained. 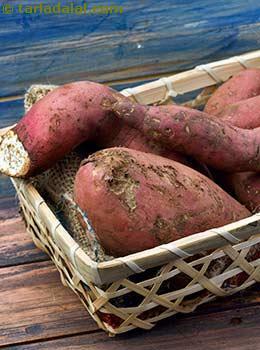 Also the fiber content in ½ cup of sweet potato is 2.9g which will slow down the absorption of nutrients. Hence slow release of energy. Furthermore, the cooking method also greatly affect the glycemic index of sweet potatoes. Thus including small portion of sweet potatoes occasionally in your diabetic menu is the correct decision. Is Sweet potato suitable for Weight Loss? ½ cup of sweet potato cubes contain 2.9 g of fiber. This will lead to slow release of energy, making you feel full for a longer period of time. Thus will control your appetite. But sweet potatoes are slightly high in calories (1/2 cup of sweet potato provides around 90 calories), thus having them occasionally to satisfy your craving is advisable while on a calorie restricted diet. Choosing the portion size of your meal is important to cut down on calorie intake of an entire day.